Provo • The first time BYU’s Moroni Laulu-Pututau suffered a season-ending injury, he wasn’t sure what had just happened, and figured he would be back on the field after a day or two of rest. The second time, he knew immediately. It was a major knee injury — his anterior cruciate ligament (ACL) and medial collateral ligament (MCL) were both torn — that would require full reconstruction. It was also incredibly disheartening, considering Laulu-Pututau had missed the entire 2017 season due to a Lisfranc foot injury he suffered three days before the opener. He felt a pop in his foot while making a simple cut in practice and at first thought he would miss a practice or two. He was wrong, obviously. The timing couldn’t have been worse with the second injury. 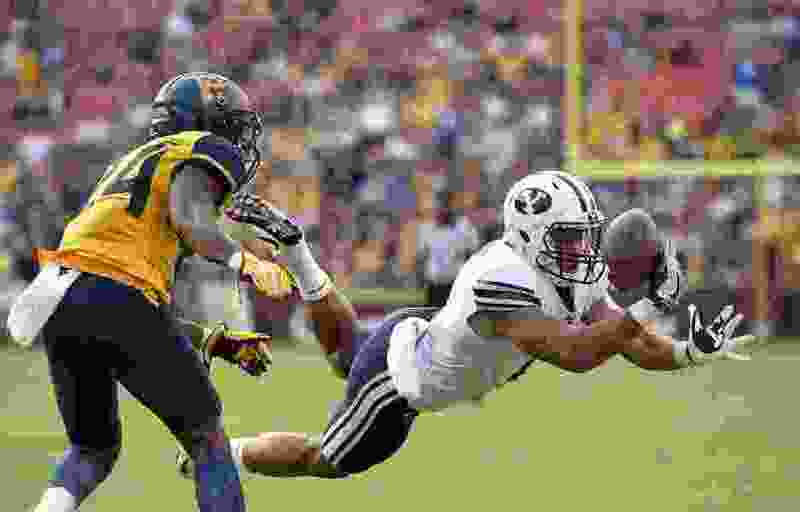 It happened on the third offensive play — against Washington — in BYU’s fifth game of the 2018 season, so it basically meant that Laulu-Pututau could not get the year back via the new redshirt rule that allows players to play in up to four games without losing the year of eligibility. He said he will never forget the play. So the 2019 season will be Laulu-Pututau’s last in Provo. And yes, he plans to be ready to play, thanks to a new medical procedure performed a few weeks after the knee injury that has him healing faster than expected. The groundbreaking surgery method was designed to return athletes to the playing field 40 percent faster than traditional knee surgery methods and was developed by renowned surgeon Dr. James Andrews. It was the first time the doctor has performed the surgery outside of Alabama and Auburn, where he is on the medical staffs of both universities. Dr. Kirt Kimball, who is BYU’s orthopedic surgeon, Dr. Jeffrey Wallentine and Dr. Kevin Christensen were also part of the surgical team in Provo last October. The 6-foot-5, 245-pound Laulu-Pututau hasn’t been fully cleared to practice, and won’t participate in Saturday’s open-to-the-public scrimmage at Provo High, but he’s already doing some light running and expects to get in heavier work this summer in player-run practices and workouts. Laulu-Pututau said he has a “great supporting cast,” which includes his wife, Kiralyn, BYU’s coaches, and his family. Laulu-Pututau said the surgical procedure is so new that it doesn’t even have a name yet. “I just call it a big blessing,” he said.